Mandalas (meaning “circle” in Sanskrit) are an important element in Buddhist and Hindu spirituality; they are symbolic diagrams, which are used extensively in sacred rites and as an instrument of meditation. A typical mandala is of a circle enclosed within a square, which has four gates – one on each side. The gates are often depicted as being guarded by demons or deities, while a bodhisattva is usually found in the center circle. 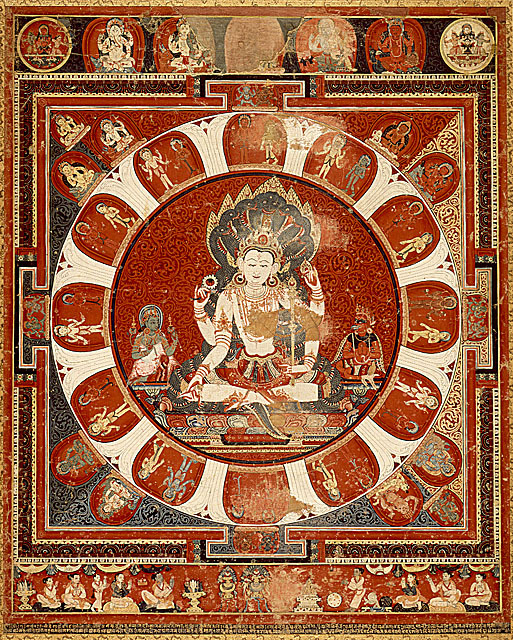 The famous Swiss psychiatrist Carl Jung, through his exploration of Eastern mysticism, came to the conclusion that mandalas are a snapshot of the unconscious mind – he believed that drawing mandalas had psychological importance due to their ability to identify fractures in personality and work towards psychic wholeness. 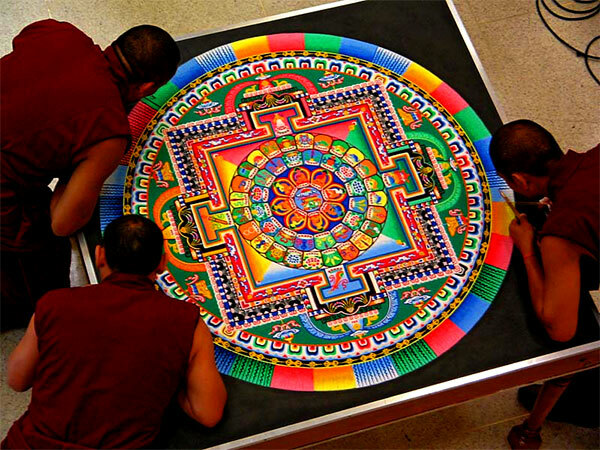 Tibetan monks creating a mandala out of sand, as a meditation on impermanence. “In Tibet, for example, they use what are called tonkas. If you go to a doctor in TIbet, instead of giving you a prescription like, “Pick these herbs by a damp rock” or “Go to your local pharmacy and get…” Instead of doing that, he often may give you a tonka, a mandala, to take home and put up on your wall and meditate upon. Now this is really far out, you see, because here’s your doctor, you go to him because you’ve got headaches, or because you’re depressed, or because you’ve got fear… and he gives you a piece of paper to stick up on your wall and meditate on. Now you’d say, ‘Well, that’s pretty primitive.” But wait a moment, just assume, for example, that they’re not all nuts, see, and they’re not all naive. And you go and sort of sit down in front of this paper and figure out what it’s about. 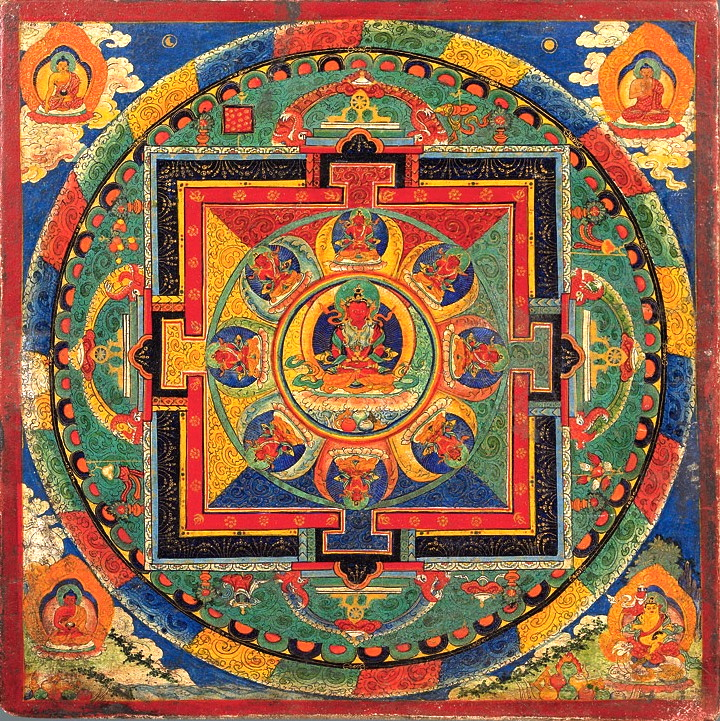 After a while you learn that the way these are designed is such that you put your focal attention on the entire mandala, which is a circle within a square and the square has gates, four gates. And then pretty soon your attention – you just let yourself be with that thing, let all other thoughts go and just stay with it – pretty soon, your attention is drawn in through the gates and in and in to the inner circle and into the innermost circle where there is a specific design or being or something and when you come in and in and in, you then experience the inner circle as something like a long tube. It takes on a depth, and as you stay with that inner circle you get drawn, literally drawn, your awareness gets drawn through that tube and you get drawn from that tube into, literally another frequency of vibration. 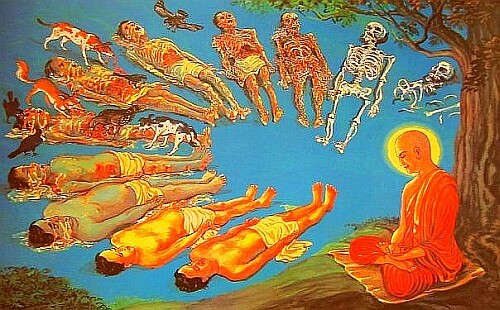 Buddhist monks often meditate on the mandala, and the teachings that are contained within it until they can conjure up the mandala in their mind’s eye without needing to physically see it. As all mandalas have a center point, looking at it can also be used as a method of centering the self, and one’s place in the universe. Tibetan Buddhists use mandalas as a method of meditating on the impermanent nature of reality, one of the Buddhas main teachings. They do this by creating large and intricate mandalas out of coloured sand, a process which can take days, and then destroying it upon completion, usually by brushing it up and depositing it’s remains into the sea. Hindu mandala which contains an image of Vishnu in it’s center circle. Drawing mandalas is very simple, and is a very relaxing form of meditation. Simply draw a dot on a page: this will become the center of the mandala, or the bindu point as they call it in India. From there you may draw a circle around that dot. From that point on it is completely up to you what you do with it, as long as the pattern is fairly symmetric. You can draw more circles, a square or two, maybe even a triangle, and then you can fill it with patterns and colour it to your hearts content. Generally no two mandalas are the same, and each time you draw one it will reflect your current mental state; it will take a snapshot of your unconscious in a similar way as writing down a dream you just had upon awakening. By meditating on your mandalas, you can center your unconscious mind without ever needing to become conscious of it. Therefore it is more powerful than dream analysis, and takes less effort. It is a good idea to date your mandalas, so that you may look back on them, and see the progression of your psyche. If you want to know more about the history of mandalas, or are curious to know the symbolism of various shapes, patterns and colours found in mandalas, then I highly recommend this book – it is the book I personally use. If you would like to see some of the mandalas I have drawn, you can check them out at the following link – my mandala collection. This mandala (illustration from Be Here Now) is an overhead view of the Borobodur temple in East Java, Indonesia. The ancient Buddhist temple was purposefully constructed to resemble a mandala; I have been, and it is amazing, even more amazing than Angkor Wat. I strongly recommend you plan to take a visit one day. This entry was posted in buddhism, hinduism, mandala, meditation/yoga, religion, spirituality and tagged art, buddhism, mandala, meditation by Michael Cunningham. Bookmark the permalink. Hmmm…. thank you for visiting my blog 100 Lotus Flowers. Mandalas were a source of inspiration for my project. I have often felt a connection to Tibet…but I have no idea why. According to your post, it may be out of the chaos of attempting to change elements of my life completely that this project was born. Which is quite true….I am searching for focus, and a sense of order, but with a difference this time. The order must speak to the core of who I am and carry me along the rest of life journey with inner peace and fulfillment. A task which may be difficult, but not impossible. Thank you for the info, I am sure it will spark more flowers. I am very very grateful for this definition quoting Carl Jung. My intention and understanding are complete as a Mandala artist over an entire 22 years.